Resilience Retrofits Are Essential, But Who Will Pay For Them? In 2016, the City of Los Angeles passed a sweeping seismic retrofit ordinance, requiring building owners to retrofit the most vulnerable buildings — soft story buildings and non-ductile concrete buildings. In earthquakes around the world, these two building types have collapsed with deadly results. In California, the majority of these are apartment buildings, many of them offering affordable housing. Similar ordinances have been passed in other cities throughout California, and many cities around the country are adopting retrofit requirements to deal with an assortment of hazards, such as hurricanes and floods. From a safety and scientific perspective, these retrofits are a no-brainer. Scientists predict that a major earthquake hitting Southern California is a question of “when,” not “if.” The frequency, cost, and impact of disasters around the world is increasing as a result of climate change, loss of natural habitat, urbanization, and building and infrastructure design that fails to take physical hazards into account. Major retrofits are needed to save lives, as well as to protect limited affordable housing stocks essential to the social and economic base of cities. However, these retrofit requirements raise important questions for owners, renters, and society as a whole. Seismic retrofits, for example, can cost thousands of dollars per unit. Many of the owners of these properties have limited reserves for investment, and seismic or hurricane retrofits provide little direct return (unless disaster strikes, of course). Retrofit requirements may cause owners to put vulnerable properties on the market or face steep penalties, putting those units of affordable housing at risk. In Los Angeles, like many urban areas around the country experiencing housing shortages, increasing homelessness, and on-going displacement, such consequences are themselves a threat to the area’s resilience. Further complicating the matter is that even buildings designed to current zoning and codes may pose challenges. Most building codes are designed for safe escape, not undisrupted function. The science behind seismic codes continues to evolve as structural engineers observe what happens in each quake. But, ultimately, codes are still currently designed to save lives, not protect building stock and local economies. Similarly, zoning still allows development in some of the most vulnerable areas, putting additional properties — and people — at risk. This is particularly true in areas at risk of climate change, including coastal and low-lying areas prone to sea level rise and flooding, as well as places along the urban fringes that face growing risk of fires and mudslides. Therefore, the total number of properties located in harm’s way continues to increase. Dealing with these thorny problems is going to take a multi-pronged approach, with many stakeholders playing a role. The first step is to secure the most vulnerable communities and properties. Affordable housing is in short supply in most cities and is often made up of the riskiest building types in the riskiest areas. To protect it, new sources of funds and financing tools are needed. Policy makers and funders must work with owners and communities to understand what the challenges and barriers to retrofits are, and design solutions that spur immediate action. Second, tools and resources are needed to encourage the retrofitting of properties more generally. This means bringing in insurance companies, lenders, investors, property owners, realtors, and others to move the market. Because the economic case for resilience relies on managing uncertainty, rather than on direct return on investment (the way that energy efficiency does, for example), new accounting tools are needed, as well as better education of consumers. The green building movement provides a great precedent for moving the market, but resilience retrofit requirements and new building standards aren’t there yet. Transparency is one approach. The new Global Real Estate Sustainability Benchmark (GRESB.org) Resilience Module provides an example of how proactive management to reduce risk and increase resilience by property companies can inform investment decisions for real estate investment trusts (REITs). This type of solution can be effective for larger companies and REITs, but will need to be translated in order to impact smaller property owners and other stakeholders. For example, similar tools could be developed to form the basis for insurance discounts, or better financing terms in the public sector to inform the selection and structure of public-private partnerships that more effectively serve the public interest. Third, government and communities need to change the way they think about building codes and local zoning. Making sure that existing codes are properly enforced and maintained is crucial. Codes can do more than ensure minimum safety standards are met. Cities such as Los Angeles are beginning to look at local codes and approval processes in order to promote resilience and sustainability (see the Building Forward LA initiative, for example). Threats like climate change and earthquakes are scary, and denial is understandable. But the challenges of the coming decades require realistic assessments, clear action, and allocation of funds in order to protect cities and people. 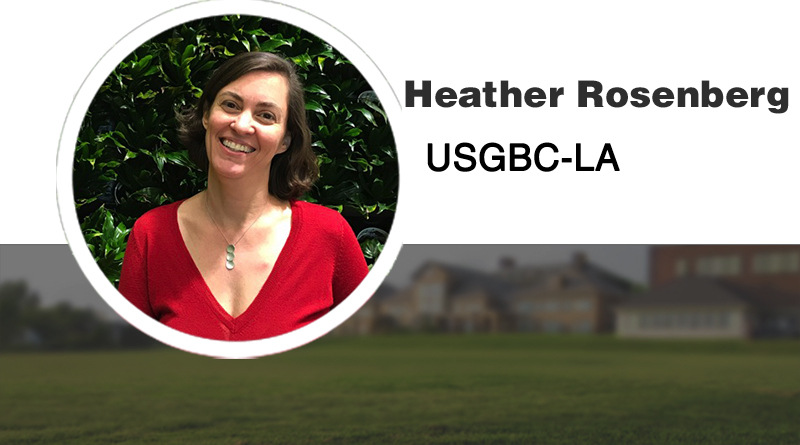 Heather Rosenberg is a USGBC Ginsberg Fellow and leader of Building Resilience-LA, a USGBCLA program for promoting resilience in buildings, organizations and communities. She may be reached at heatherjoy42@gmail.com.